Bobby Godric quit school, built a tech empire from scratch, and became a multibillionaire by the age of thirty-two. Tireless, inventive, and skilled at surrounding himself with brilliant minds, it seems there is nothing he can”t do – except save his beloved wife, Nora, from brain cancer. But Bobby will not allow even death to stand between him and his one true love. And if there”s no way on this Earth to bring her back, he’ll find another Earth. Devoting his vast fortune and an extraordinary team of scientists and visionaries to the task, Bobby finds the holy grail he so desperately seeks: proof that infinite parallel worlds exist in other dimensions – and the means to reach them. Rescuing his lost love from a world where destiny has not doomed her is all that matters to Bobby Godric – until he encounters a monstrous alien race systematically annihilating humankind and claiming planet Earth, again and again, on a murderous march of conquest across the dimensions! Unless the multiverse of duplicate Earths can be rallied against the invaders, the next world to fall will be our own! 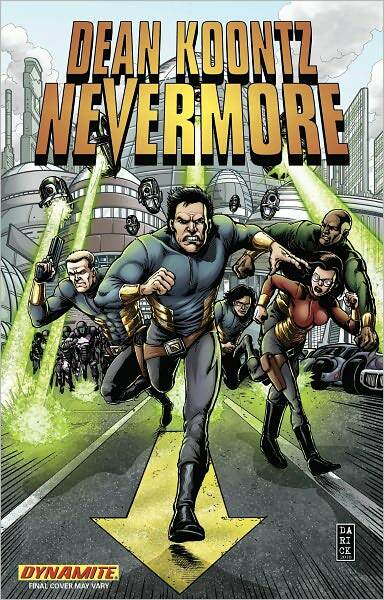 Conceived by New York Times bestselling author Dean Koontz and adapted for comics by writer Keith Champagne and beautifully illustrated by Leno Carvalho Nevermore is a marvelous flight into breathless suspense, mind-bending imagination, and chilling terror not to be missed!